For those who may not have been following along, I bought this Catera a few months ago on the cheap because it had a noisey timing belt tensioner or pulley, it needed control arm bushings, and a few other odds and ends. Over the course of a few months I installed the new control arms, a battery, new hood struts, and bought the timing service kit and water pump. 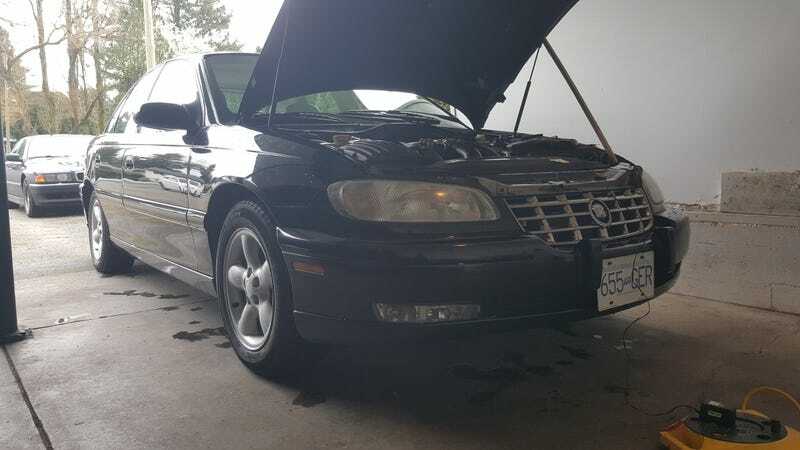 For months I avoided starting the car out of fear the thing would jump timing, but like an idiot I fired it up the other day to move it in anticipation of the mobile mechanic coming to do the timing service. As soon as I fired it up the idle dipped and it stalled, and would not restart. Well, after being blown off by one mechanic on Sunday, then sending him packing when he finally showed up on monday because he wasn’t competent enough to do the job, I finally got someone out here yesterday to have a look. Mobile mechanic opened up the timing cover to find that the belt was slack and the timing was way out of spec based on the timing marks. Ugh. Neither of us had high hopes, but he retimed the engine, installed the new pulleys, tensioner, and water pump. Turned the key, and it fired right up! Initially the head was making a loud ticking noise and I was fearful something was damaged, but it just turned out that the lifters needed a bit of bleeding. The car now runs very smoothly and quietly, and seems to handle well based on the few unregistered, uninsured laps around the neighborhood that I did. Now to work on the ailing e38, and put a heater core in the Mercury because it decided to humidify the cabin the day before yesterday. Fun.